Say the words "Judge" and "Dredd" and one name should rather forcefully present itself. Not Sylvester Stallone nor Karl Urban, who played the legendary futuristic lawman in two celluloid interpretations (one dreddful, one ace) of the comic book classic. No, it's John Higgins – the Liverpudlian comic book artist who helped cement Dredd's uncompromising style and world in the pages of 2000 AD. But Dredd isn't Higgins' only work. Over more than 30 years this scouser forged a reputation working on some of biggest and best-known titles: the award-winning Batman: The Killing Joke and cult favourite Watchmen to name just two. Such adaptability has earned Higgins an exhibition at the Victoria Gallery & Museum in his hometown at the University of Liverpool. It is the first major retrospective of his work. We are promised the exhibition will "provide a glimpse into the extraordinary imagination of Higgins – an output which crosses the boundaries between comics, graphic novels, cinema, television, advertising and music." 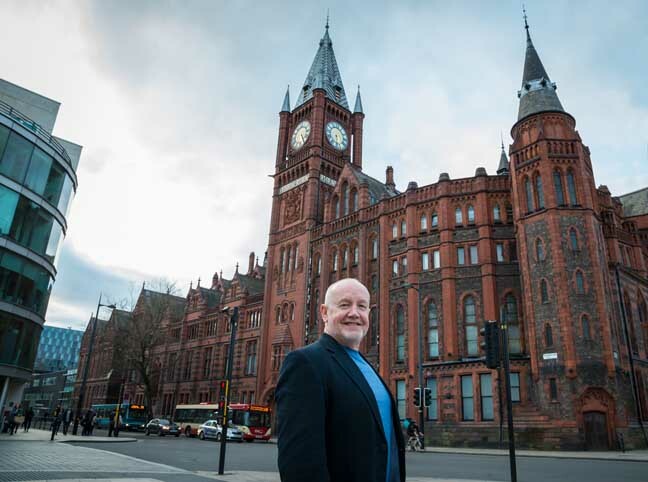 Not only that, but the uni will this month host an evening with Higgins on May 19. "The root of the exhibition is Science Fiction, comics and illustration, of which I am very proud," Higgins told The Reg, "but more than that this is about Liverpool, about my roots, family, friends, support network and all the creative hands behind the presentation of this exhibition that features my art". The exhibition was the result of years of pressure and coaxing from friends and colleagues, he said. VG&M curator Leonie Sedman "saw threads and connections to the art that even I as the artist did not see until it was pointed out. I am blown away by it all." Not as blown away as a felon on the wrong end of a Dredd arrest, I'm sure, but regardless, how did we get here? Born in 1949, Higgins attended The Wallasey College of Art and studied technical illustration, leading to a stint as a medical illustrator at The Royal Marsden in Chelsea. As a fan of science fiction and fantasy, he found his direction as an artist through the covers of his favourite books. He was initially inspired by Bruce Pennington, the British artist responsible for some of the most memorable covers for Frank Herbert's Dune series, but when Higgins saw his cover for A Princess of Mars by Edgar Rice Burroughs he knew he had found his vocation. In December 1977, Higgins completed his first commission for 2000 AD – home of Judge Dredd – while also illustrating for SF Monthly. Trying to concentrate on his passion for all things sci-fi, Higgins took on a variety of illustration work covering advertising, book illustration, animation, comics and magazine covers. Honing his skills luckily coincided with more and more commissions from 2000 AD, the perfect focus for his interests. Then-editor Steve McManus gave him the opportunity to join the small group of regular artists who worked for 2000 AD during the 1980s. The pace and versatility of the work at 2000 AD meant Higgins would often have to vary his style from one week to the next painting in full colour a Judge Dredd strip for the 2000 AD Annual or drawing a black and white line Future Shock story written by Alan Moore. This relationship with Moore was cemented when artist Dave Gibbons approached Higgins to join him and Alan on the Watchmen team. Watchmen quickly became a cult classic and this, combined with his work on Batman: The Killing Joke also by Moore, raised Higgins' profile as an artist considerably. 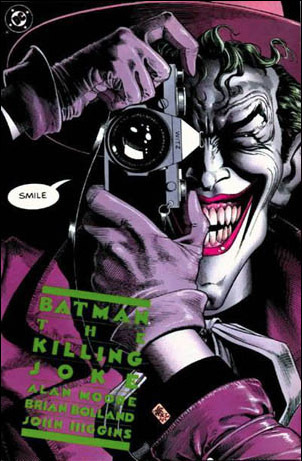 The Killing Joke, published in 1988, is widely regarded as one of the finest Dark Knight stories. It tells of the Joker's attempt to send Commissioner Gordon insane. Suddenly there was interest in Higgins' work from the big American publishers such as DC Comics, and a free rein to co-create World Without End alongside writer Jamie Delano. This was a fully painted six-issue sci-fi series published in 1990 set in a world where genetic mutation creates the ultimate battle of the sexes. It was while working on World Without End that Higgins realised the process of doing fully painted comics was financially unfeasible and line work was the way forward. But in the US comics industry you're but a cog in a huge machine, and Higgins has always welcomed control over his work. In 1999, he decided to self-publish a project of his own, something where he would have complete control – Razorjack. Full of Lovecraftian reveries, Razorjack is basically The Bill meets Cthulhu as two police officers fend of supernatural terrors from a twisted dimension. Ultimately Higgins had to rely on independent publisher Com.x to finish the process. It has now been reworked by Higgins and Titan Comics and is well past due an outing as a HBO TV series. The 1990s gave rise to a new wave of digitally produced and coloured comics and after firmly establishing his artistic style Higgins decided to create Turmoil Colour Studios to explore digital colouring processes. This ability to diversify his artistic approach allowed him to revisit his work on Watchmen in 2005 and digitally remaster the colour. Higgins had always been frustrated with the limited reproduction of his colouring and felt this new digital process was a clearer representation of his work. His relationship with the Watchmen narrative has been extended significantly by his work since 2012 on the Before Watchmen series combining his writing and artistic talents. As Higgins tells it: "Watchmen was an incredible experience working with two of the most talented creators in the comics world, Alan Moore and Dave Gibbons, on an innovative graphic novel that featured in Time Magazine's top 100 of the 20th century's greatest novels." According to Higgins, Watchmen is more than a graphic novel. "Watchmen rubs spines with such classic prose literature, as 1984 by George Orwell, Lord of the Flies by William Golding and the other 99 greatest novels," he told me. He went on to work on Before Watchmen in 2013, a series that elicited a storm of protest from fans. "I accepted for the reason it had a broad Watchmen framework set in place by the original creators and it did not deviate into a broad DC Comics Universe," he told me. He was involved "in an almost peripheral way" with Curse of the Crimson Corsair. "I could see the reasons to do a pirate story in the context of Watchmen in a completest way, but whereas the original pirate story Tales of the Black Freighter was a reflection of the main story and added emotional emphasis in an almost subliminal and abstract way. There was no overarching story that tied all the Before storylines together, other than that they were Watchmen characters," Higgins said. "The Before Watchmen series was very hit-and-miss creatively, but I think a valid attempt by the publisher, whatever else you might think about that, to broaden the world of Watchmen, but it did prove, if it needed proving, only Dave and Alan could do Watchmen. Without them it wasn't Watchmen." But in 2006 Higgins and Gibbons reunited as the latter resurrected Thunderbolt Jaxon, a character seen in the UK comics Comet and Buster from the 1940s and 1960s. Higgins calls the Thunderbolt Jaxon work some of his best, updating an old British character to a new audience. So, where next for Higgins? A return to two of his favourites – somebody else's and his own: Dredd and Razorjack. Razorjack will feature in a crossover adventure story for the Judge Dredd Megazine, written by regular collaborator Michael Carroll, who has written many Dredd stories and worked with Higgins on Razorjack. "We know who Dredd is, but who – or what – is Razorjack? She is the noise that wakes you up at night, but where is it? Outside the door to your darkened bedroom? In the wardrobe? You hold your breath, listen in mind-numbing fear, dreading to hear the sound again, hoping it was all a bad dream. Until... you hear it again! She is a nightmare becoming real," Higgins said. In the story, three college kids will get caught up in a vortex of violence and action spanning multiple dimensions having accidentally opened a gateway to a dimension ruled Razorjack. You can expect undead assassins, secret societies, a serial killer, and Frame, a hard-bitten cop, and his young assistant Ross, who start out solving crimes and go on to save worlds.